OWH Stars and Stamps (Our OLD blog! ): Happy Veterans Day! Today is Veteran's Day - a time to honor those who have served. And how better than to share an AnyHero card for someone serving overseas! 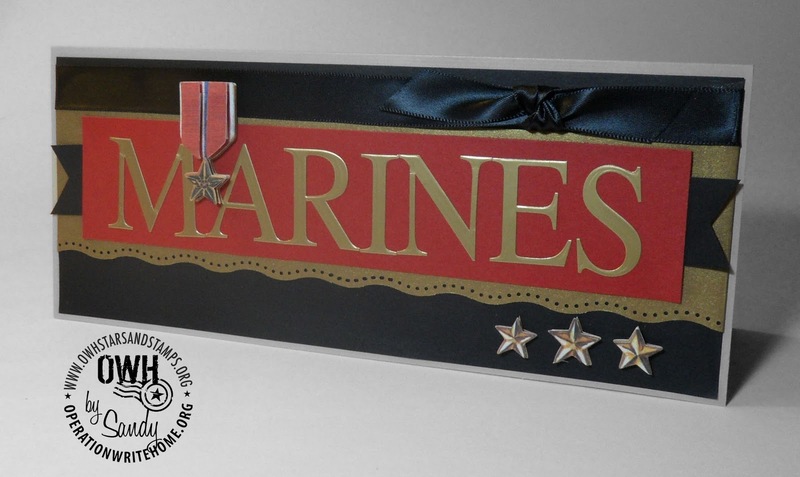 This is a special one made just for a particular young marine...the daughter of our own cardmaker Monica! She's *just* arriving in Afghanistan in the next few days, and we'll be getting the last holiday box in the mail to her. You can see a photo of this fine young marine here. The "MARINES" letters and 3d stickers are all donated stickers from EK Success. Thanks so much for sending that box to my daughter. She is so excited to receive it and share the wonderful cards with her unit. I've linked to a collage of four digital cards I designed and printed out for our church's Veterans' Day service this Sunday. Everyone will receive a blank card and pen and we will take time during our service to write notes of thanks and appreciation to currently deployed service people. The younger kids will color OWH coloring pages and the youth will sign cards during Sunday School. Over 1,000 cards have been prepared - hopefully, most will be signed and sent to OWH to send to our troops! What an awesome Any Hero card! These are my favorite to make. And thanks for offering some of these stickers packs in the drawing! YAY!